Style Wear in Fountain Plaza has long skirts, quirky pajamas, and palazzos in super comfy fabrics. Fountain Plaza is a storehouse of budget clothing stores filled with quirky merch, and Style Wear adds to the list. If you’re looking for nightwear, palazzos, skirts, or short tops, check this store out. Cute prints on nightwear is such an adorb thing, don't you think? We found cutesy owl pajamas and we rejoiced when we saw the price tag that said INR 150. Another pair of baggy pants had penguins and dinosaurs on them and caught our attention. You will find palazzos with bandhani and block prints, too. So just pair them with a black tunic and you are good to go for a casual look. We loved the white palazzo with yellow dandelions and lotuses which was priced at INR 200. You will also find loads of Rajput and Rajasthani designs on these palazzos. These palazzos are made from cotton sourced from Tirupur and Salem. There are loads of long skirts at this store, and if you’re someone who likes ethnic designs at budget prices, you won’t be disappointed. 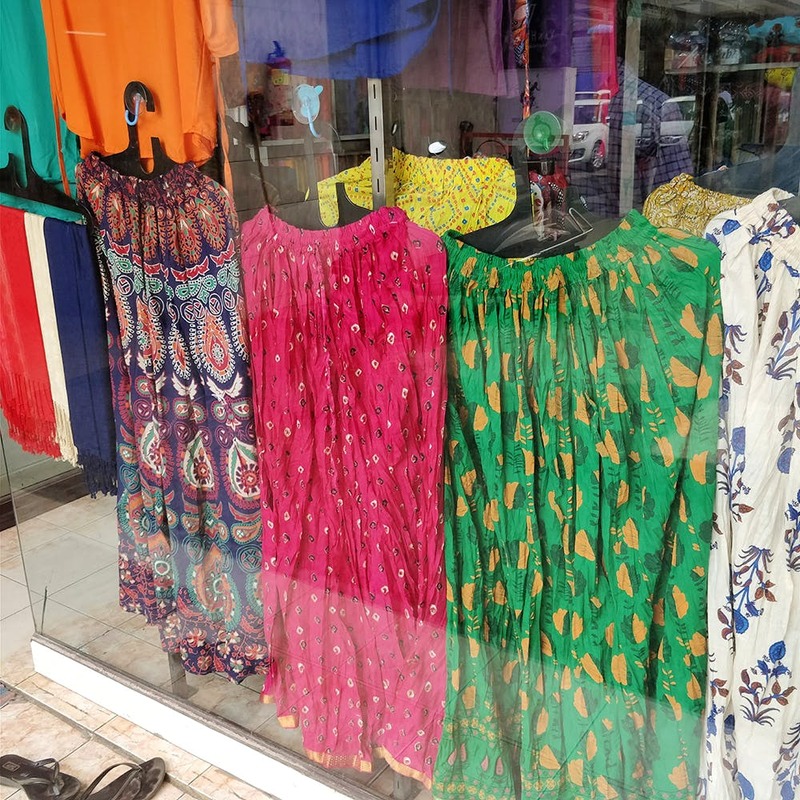 The skirts come in pastel and bright colours with embroidery and block prints. They are priced from INR 200. We loved the off-white wrap around skirt with golden deer. Another red skirt has elephants marching on one side and peacocks on the other, so you can wear it inside out if you want another design. The skirts are available in different fabrics like rayon, cotton, and Ikat and they’re super comfortable. So, drop by this store if you’re looking for pocket-friendly. This store is pretty tiny and can get crowded on weekends, so drop by on weekdays.